Fish, scientifically known as vertebrates are the creatures living wholly in the water. One of the most beautiful creations of nature, blend of different color and pattern make them beautiful. Fish are classified into several categories. In the recent times, fish have been quite popular among human as a pet animal. This article will help you to decide which freshwater fish to choose for your home aquarium. Fish make truly a great pet for the people who don’t have time and physical space to devote to a pet with high maintenance. Moreover, we can also use the fish as a starter pet for children so as to teach them the responsibilities of a pet. They are known to provide a calming effect on the one who sees them. Also, they come in a variety of shapes and vibrant colors. Moreover, some type of fish can communicate with their owner with signs. A fish can be taught tricks too. Thus making them an easygoing pet for home. It is a freshwater fish, slender in stature, and comes in three colors (black, white, scarlet). Cherry Barb, comes from the broad “Barb” category of fish. Fish is slender in shape with a compressed body, they can grow up to 5 cm in length. The creature is a native of Sri Lanka country. It is fawn-colored on top and slight green at sheen its sides and belly have. The male is redder in color than the females. The behavior of Cherry Barb is peaceful. One can keep them with other fish. This fish is omnivore by nature, so it can eat both algae and meaty food. Fish can also take dried food such as shrimp, also freeze food. One can use aquarium of 20 gallons so that they can wander easily in the aquarium. Discovered in SouthEast Asia, making its ground in the rice paddies and ward floodplain of the region. Through cyclic changes these fish developed the ability to intake oxygen directly from the air as well as from its gills, becoming a true labyrinth fish, thus making them self-sustainable in oxygen deficient water. The long flashy tail is an attraction for all. The name of this fish “Betta” comes from an ancient clan of warriors, called the “Bettah”. Generally beta fish comes in small size, but they can range considerably from 2.5 cm to 12.5cm in length. These creatures are anabantoid, making them inhale oxygen from air as well as from their gills inside the water. The one thing that makes them more peculiar is their vibrant color, also their tail shape. 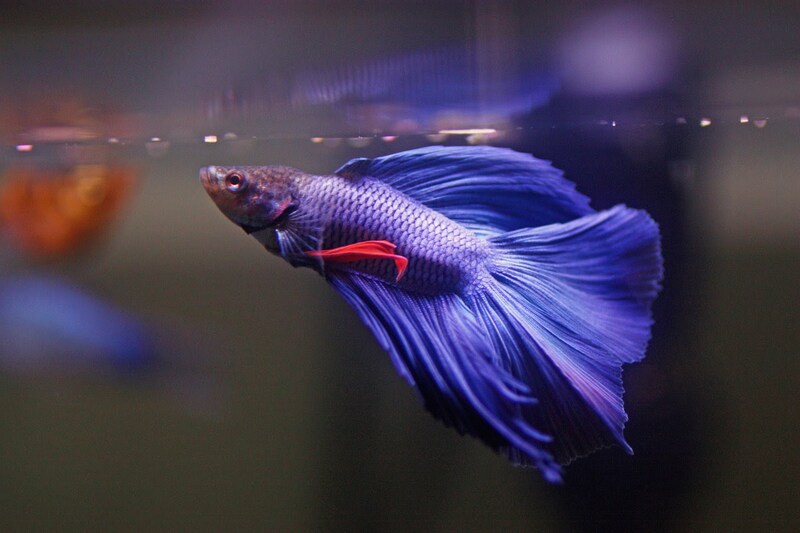 Betta have various tail shapes-“veil tail”, moreover other tail shapes include “short-finned fighting-style tail”, “crown tail”, “double-tape”, and ,”half-moon”. As their name is given after ancient clan of a warrior, they reflect the same nature. However, there is variation in behavior of both male and female betta. Male betta will adapt well to community tank given that there is no other betta present in the tank. On the other hand, female exhibit more of get together behavior, as long as there is no new one placed in the tank. Betta feeds primarily on the water surface, they are an omnivore in nature. A good diet includes brine shrimps, bloodworms, tubifex worms, betta pellets. The nutrition from this food help betta to increase the longevity and improve various coloring. Betta cannot survive on plant root they need high vitamin food in order to show growth. The life expectancy of Betta Fish is 3-5 years in captivity. Provided good living conditions and healthy food their lifespan can be increased. Use tank size of more than 5 gallons, bigger the thank size more will be the chances of fish to thrive-bigger the better. Filter the water on a regular basis use a gentle water filter for filtration, also avoid plastic plants and use live plants. Moreover betta fish tend to come out in light, provide a stable schedule for day and night. Leave the gap at top of the tank so that betta could come at the surface of the water. 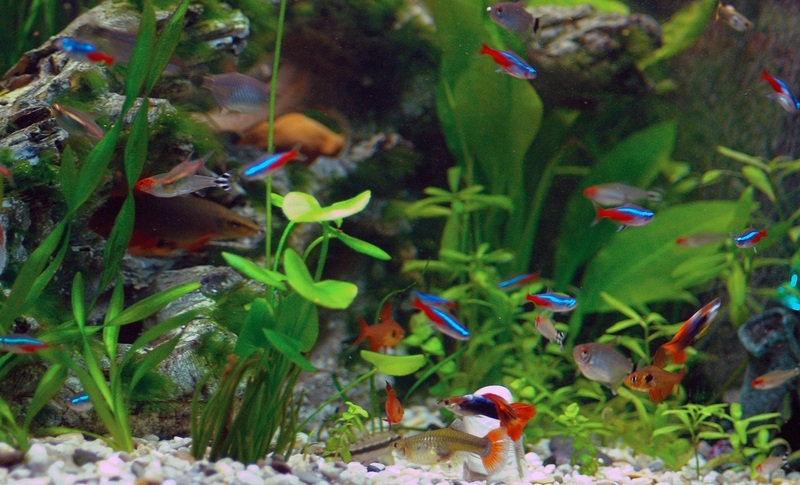 Featuring among the famous freshwater aquarium fishes, Neon Tetra is small in size and like to live in a group. They are fast in maneuvering from one place to another so they will take every single empty space in your tank. This vibrant fish is one of the oldest tropical fish, they are one of the easy and sought after fish- reason being is because of their calm temperament and easy care. Neon Tetra is a freshwater fish and comes from characin family, it can grow up to 3 cm in length. They are native to black water and clear water stream and are found in the basin of river Amazon in South America. The bright color of the fish makes it visible in the dark water too. Tetra is considered jewel of the water, with blue bodies and bright red tail. When kept in groups these creatures creates a beautiful splash of colors. As a native to South America, these fish prefer densely planted system with plenty of low lights. Omnivore by nature, neon tetra can eat anything that fits in their mouth. This does make feeding these fish easy and simple. In their natural habitat neon tetra feeds upon algae, green larva, small vertebrates. Given food can be; medallions, blanched zucchini, flake food. I would suggest using Hikari Micro Pellets, this food is really good as its nutrition value is very high. Also, frozen food can also be given to fish as a feast, it prefers bloodworm, brine shrimp, daphnia. Life expectancy of neon in ideal cases is about 6-8 years. If good tank conditions and good nutrition is provided then the fish can live up to 10 years. Some cases have reported a lifespan of 12 years. For beginners tank size of 20 gallons for the fish is good. Large tank size will allow the fish to move easily and give them space to thrive. Furthermore, large tank makes it easy to take care of the environment. An aquarium with small size will result in water change more frequently and change in pH of water making it unsuitable for your tetra. 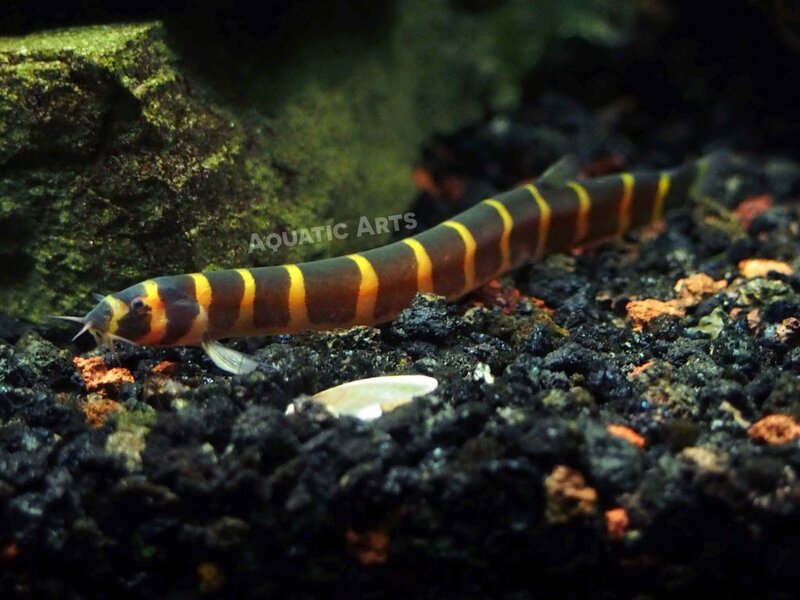 Also known as Coolie Loach, Kuhli Loach is a native to Tropicals water of Indonesia, Malaysia. This creature resembles an Eel and is very slender and nocturnal in shape. 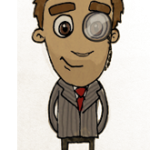 brown to black vertical bars work as a signature. However, a distinction between males and females is not readily apparent, closer inspection reveals that males have a rather strong jaw compared to female. Khuli Loach tends to inhabit slow flowing stream or river. Khuli loach is an eel shape fish which comes from the Loach family. It has slightly compressed side and 4 pairs of barbels around the mouth. This creature is known as a bottom feeder fish, it will feed anything on the bed of the water or bottom of the aquarium. Loach is calm by nature and is kept in a school of 3. It reaches maturity at 2 ¾ inches (7 cm) and has a maximum length of 4 inches (10 cm). Many fish can be kept with Khuli because of their calm temperament, it should be taken care of not to include fish that can take them as a food. Khuli loach feeds at night and hides during the day. Khuli Loach is a scavenger in the wild, and because of this, they will feed on anything given to them in the aquarium. To ensure their healthy diet, we must feed them in combination with frozen food. These fish mostly feeds during night time so ensure to feed the fish after switching off the light. When it comes to frozen food, fish enjoy bloodworms, daphnia, brine shrimp, and blackworms. The lifespan of this fish is around 10 years in normal conditions. 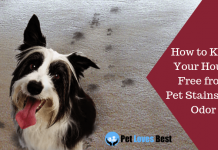 However, if proper care is taken then they can live up to 12-14 years. The Khuli Loach has an advantage over other loaches as it never grows too much. It is not demanding fish and can thrive well in an area of 20 gallons. However, Anything less than that would not be suitable for them. Apart from that, we have to make it sure to keep these fishes in a pair of 3 or 4. Because they are social by nature and keeping them alone would make them stressful. Furthermore, they also may go into permanent hiding. We should keep them in larger groups which will allow them to exhibit more natural and playful behavior when there are more of them. The Sword Tails is a species of freshwater fish and comes from Poeciliidae. 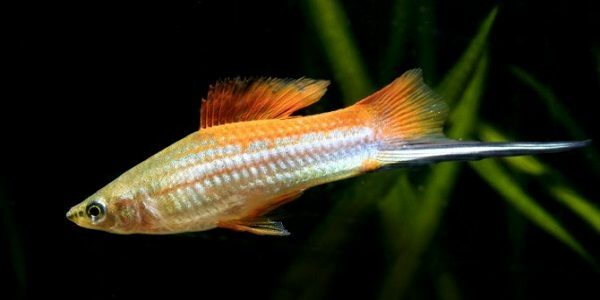 This fish comes in different color and have a quite unique type of fins commonly known as Red swordtails or Green swordtails. They are livebearers which means that the baby fish come out free swimming. The Sword Tail fish is a freshwater fish and is an inhabitant of North America. It is one of the most popular fish among the people. Easy to maintain, it is very much compatible with the diverse environmental condition. We can easily keep it in a variety of water conditions. There is variation in size among the male and female, males are slightly smaller than female. Female can grow up to 6.3 inches and male 5.5 inches. Sword Tail is omnivore by nature. Which makes them accept any kind of food. Swordfish eat algae and greens in their natural habitat. One can give them quality flake food or bloodworms. Don’t neglect to mix proper herbivore food in their diet. The lifespan of this creature is around 3-5 years in normal conditions. 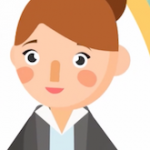 But, with food and habitation, we can increase life expectancy. One can use aquarium size of 10 gallon. 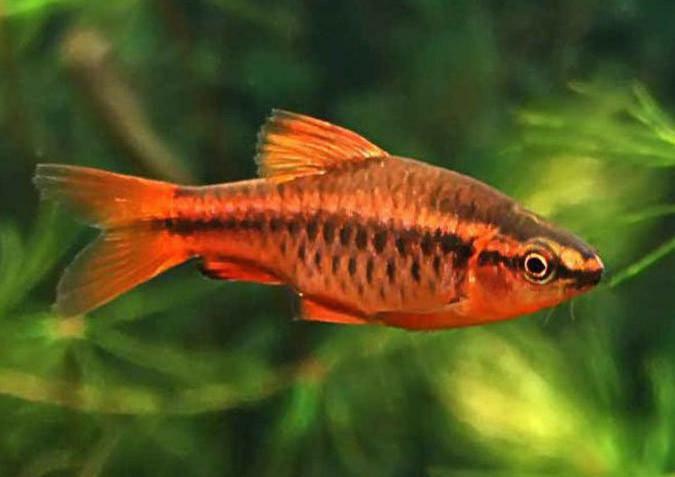 We hope that this article on Best Freshwater Fish provides you the information on various freshwater fishes for the home aquarium. We have reviewed 5 such fishes, which will give your home the perfect ambiance and have given a detailed guide to select suitable fish for your tank. Previous articleBenefits of Keeping a Fish Tank – Scientific Facts! Next article5 Common Aquarium Fish Diseases – Symptoms & Cure! Fish are vertebrates. Invertebrates are creatures without backbones such as snails and crustaceans.